Previewing the first night of the Democratic convention on Monday's "Situation Room," host Wolf Blitzer and a network graphic repeatedly identified the announced speakers as liberal. The CNN anchor asserted, "The speaker lineup for tonight, by the way, here at the convention, includes some of the party's most prominent and most liberal members, including the House Speaker Nancy Pelosi, Senator Ted Kennedy and former President Jimmy Carter." Blitzer then asked guest James Carville if "...highlighting all these liberals tonight, is that the way these Democrats can reach out to moderates, to independents and say, you know what, it's time for a change?" Carville praised the work of cancer-stricken Senator Ted Kennedy and predicted high emotion. Fellow guest, conservative radio host Bill Bennett, replied, "Oh, it's their party and they can be emotional or cry if they want to or be liberal if they want to." He also added, "But this is a more liberal party. It is a more liberal platform than we had with Bill and Hillary Clinton. It's different. This is not your big brother's Democrat Party." WOLF BLITZER: The speaker lineup for tonight, by the way, here at the convention, includes some of the party's most prominent and most liberal members, including the House Speaker Nancy Pelosi, Senator Ted Kennedy and former President Jimmy Carter. Let's talk about that and more with our CNN political contributor and Democratic strategist James Carville, along with our CNN political contributor Bill Bennett, the host of the conservative national radio talk show "Morning in America" and a fellow at the Claremont Institute. James, highlighting all these liberals tonight, is that the way these Democrats can reach out to moderates, to independents and say, you know what, it's time for a change? BLITZER: It will be an emotional moment. CARVILLE: It will be a very, very, very emotional moment and, by the way, you know, Speaker Pelosi is the Speaker of the House of Representatives of the United States, the highest ranking government to ever serve -- the highest ranking women to have ever served in the United States government, Congress. So I think it will be great. 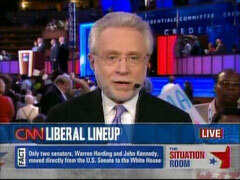 BLITZER: You think that this is the way the Democrats should be kicking off their convention, this, the first night, Bill? BILL BENNETT: Oh, it's their party and they can be emotional or cry if they want to or be liberal if they want to. But it is going to be emotional. Their lion -- Ted Kennedy is their lion. But it is liberal. There's no doubt about it. The Clintons have been dethroned. They're out. They're gone or so we think. I guess that's yet to be decided. We're all watching that with interest. But this is a more liberal party. It is a more liberal platform than we had with Bill and Hillary Clinton. It's different. This is not your big brother's Democrat Party. It's your father's Democrat Party. It's back to the left.